Information on Paratus Wealth Management’s web site is for informational purposes only. No information should be construed as an offer to sell or an offer to buy any securities. No information on this site should be construed as investment, financial, or business advice until you have opened an account and discussed your personal needs with a Paratus Wealth Management, LLC financial adviser. All reporting is based on historical information, and is not an indication of future results. No specific investment results are guaranteed. Investments are not insured against losses from fluctuating value. 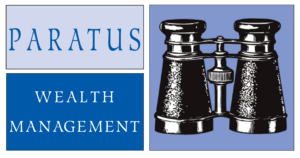 Paratus Wealth Management, LLC is an independent Registered Investment Adviser (NASD CRD #137103). Please contact us today! We look forward to hearing from you.